June is astrologically in spring, and meteorologically in summer. Perhaps gardeners are in the meteorological camp. It is hard for me to consider the current garden a spring one. Peonies, irises and lilacs all say summer to me. The early roses are blooming. Wisteria, laburnum, the Carolina Silverbell have finished. This morning, I found some blossoms on my tiny Styrax - also known as Japanese Snowbell tree. I got to smell the sweet scent that they are known for. For those who watched television in the 1950's, there was a wonderful expression in Rod Serling's series The Twilight Zone. It was: "Submitted for Your Approval". I find out that it was only heard in three episodes. It is a phrase that most of us associate with the series. 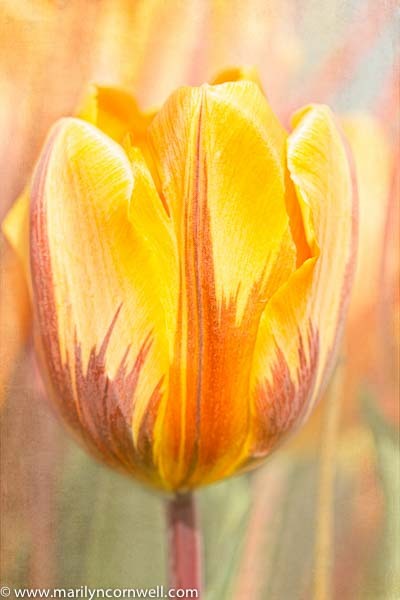 This phrase came to my mind as I looked at my Finalist image of a tulip in the Betterphoto's April contest. For me, a tulip embodies spring. Having tulips in the garden in June seems out of synch with the season we're in - meteorologically early summer. The phrase "submitted for your approval" came to mind. It is an invitation to consider that we've arrived into summer.